PanARMENIAN.Net - Secretary General of the International Organisation of La Francophonie Michaëlle Jean said in a tweet on Friday, September 14 that she is honored to be decorated with Armenia’s National Order. Jean visited Yerevan on Tuesday and paid tribute to the memory of 1.5 million victims of the Armenian Genocide at the memorial in Tsitsernakaberd. She then met Foreign Minister Zohrab Mnatsakanyan and gave a press conference afterwards. “Armenia, a country of heart, values, courage and resistance. To be decorated with the National Order is an immense trust, recognition and a great honor. Armenians, #Francophony loves you!” the Secretary general tweeted. Armenia is hosting the Summit of La Francophonie on October 11-12. French President Emmanuel Macron and Canadian Prime Minister Justin Trudeau are among the heads of state expected to arrive in Armenia for the event. 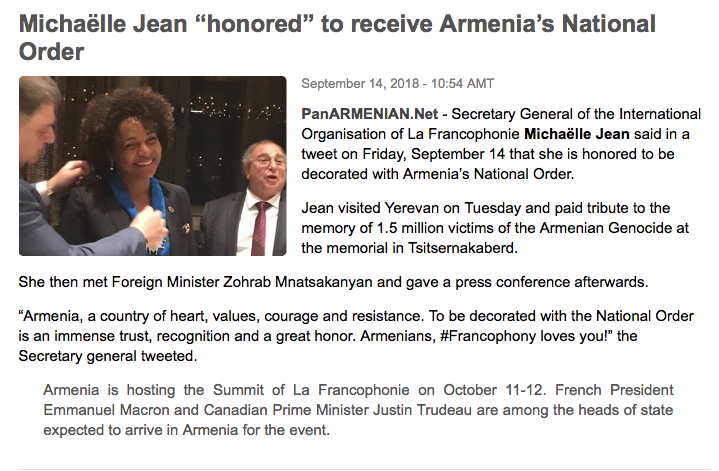 Source: http://www.panarmenian.net/eng/news/260030/Michaëlle_Jean_honored_to_receive_Armenias_National_Order, September 14, 2018 .